The Soyuz rocket verticaly integrated in its launch complex in Kourou on May 7. The maiden launch of the veteran Soviet-Russian rocket Soyuz from Europe's space base in South America has been scheduled for October, a spokesman for launch operators Arianespace said on Tuesday. The maiden launch of the veteran Soviet-Russian rocket Soyuz from Europe's space base in South America has been scheduled for October, a spokesman for launch operators Arianespace said on Tuesday. "Right now we are looking at mid-October" for the first launch, said spokesman Mario de Lepine. Soyuz will carry the first two satellites in Europe's Galileo navigation system, the competitor to the US Global Positioning System (GPS), he said. 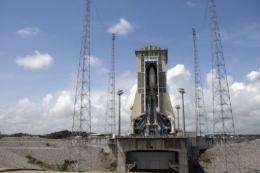 The European Space Agency (ESA) and Russia agreed to deploy Soyuz at Kourou, French Guiana, under a 2003 accord to provide Arianespace with a medium-sized launcher. A ceremony was held there on Saturday to mark the launch pad handover, which required major modifications. Soyuz traces its lineage to the pioneering days of space, from launchers used for Sputnik in 1957 and Yuri Gagarin's first manned flight on April 12, 1961. With more than 1,700 launches to its credit, it is the most used and most reliable rocket in history. Up to now, it has only ever been launched from Russia's bases at Baikonur in Kazakhstan and Plesetsk, Russia. Saturday's ceremony in Kourou saw a stone from Baikonur sealed at the launch pad to symbolise the links between the two sites. Using a manned capsule, the launcher will be the only form of human transport to and from the International Space Station (ISS) when the US space shuttle is phased out in the coming months. The infrastructure at Kourou has been designed so that it can be adapted for human spaceflight if need be, according to ESA. The Soyuz-ST model that will be deployed in Kourou will be able to hoist nearly three tonnes into geostationary transfer orbit. ESA's heavy launcher, the Ariane 5, can place up to 9.5 tonnes in low Earth orbit. A new small rocket, the Vega, with a launch capacity 1.5 tonnes, is also due for its maiden flight this year.